Does furniture have a soul? I sort of think it does. We sit on, lean on, and lie down on furniture for most of our lives. It’s hard to believe that something of our souls does not get infused into the furniture. Some cultures do honor furniture more than just putting it in a rummage sale or giving it to the Salvation Army (which is not a bad thing, of course, because then one is spreading one’s soul around). Putting old furniture in museums should be a rule, because then it’s as if we’re honoring all of the souls connected with a particular piece. And refurbishing vintage furniture is like putting new clothes on an old soul. This stool, found in a noble tomb in Saqqara, is similar in style to stools found in the tomb of Tutankhamun (ruled 1336–1327 BCE). Although furniture is one of the few genres of art that were not specifically involved in the funerary process, the favorite furniture of a deceased person was included in tomb burials to accommodate the needs of the deceased in the afterlife. I have a feeling the Egyptians did not coin the phrase “you can’t take it with you” when viewing all of the worldly stuff they packed into their tombs. Stools were the most common furniture item in Egyptian homes, having either a curved wooden seat or woven cane seat. They were also the most common item left in tombs. They were common furniture items already in the Old Kingdom (ca. 2650–2152 BCE). By the time of the New Kingdom (1539–1295 BCE), stools had morphed into elaborately carved and decorated items of status. 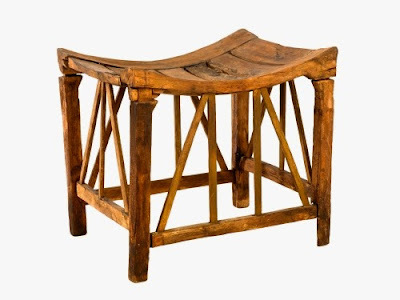 Egyptians invented the folding stool, handy for commanders on the battlefield. Those were decorated lavishly to represent the military leader’s status. This simple stool may have belonged to someone of not-so-high rank, although fancy cushions would have augmented it. Such an elegant design, however, would not have been made for a commoner. Various types of convenient furniture were definitely the province of the upper classes. 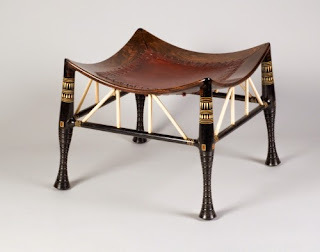 The equating of a piece of furniture with the status of a person is not unique to the ancient Egyptians. Although, equating the stool itself as a vehicle for the soul of the deceased is a little different from the Egyptian custom. Traditionally in the Asante culture in Ghana, stools acquired a very special status all their own based on who owned them. The stools of rulers were considered particularly blessed with the owner’s soul, and would be given libations and stored in a special place of honor to commemorate the deceased owner’s wisdom, and be consulted by the living. In some ceremonies, stools were traditionally blackened and presented with libations as signs of honoring the deceased owner of the stool. During the annual Yam Festival, they were traditionally fed samples from the new yam crop. Common person and community leader alike had their own stools that were then assumed to carry their soul after death. Only the stool’s owner may sit on it because it holds that person’s personal power. Stools would be commonly tipped on their side when not in use by their owner to prevent anyone else from sitting on them or to avoid malevolent forces. 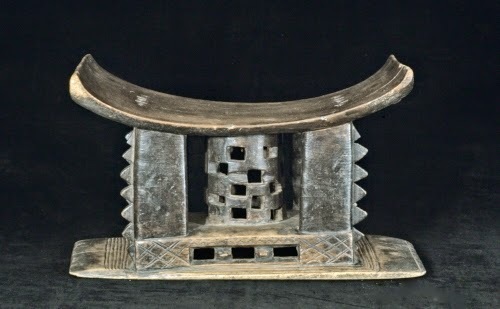 The form of Asante stools is typically a curved seat with central columnar support, often augmented with four legs, and decorated. The form of the stool is thought to imitate that of the Golden Stool in the Asante capital of Kumasi, the state stool that represents the line of the Asante kingship and is not technically owned by its current occupant. And now we progress from status of a deceased person in the afterlife, through the stool bearing its owner’s personal life essence, to just plain crass status in the physical world. The mid to late 1800s in European and American art and architecture was dominated by revival styles that borrowed everything from ancient Egypt to the Renaissance, Baroque, and Rococo. Egyptian Revival rose to importance in the 1830s after the second publication of studies and folios of prints of Egyptian architecture and antiquities from Napoleon’s 1798–1799 campaign in Egypt. “Egyptian” decorative arts remained popular from that period through the Art Deco of the 1920s and 1930s in both Europe and America.